I gave this jacket a real baptism of fire by taking it high into the Scottish Highlands at the dreg-end of winter. Happily, it passed this sternest of tests with every flying colour imaginable. With cuffs and hem fully tightened, it locked out the most aggressive hail-flecked gusts. The hood fitted snugly, protecting my face from the wind but never obstructing vision, and all the pockets were easily accessible, even with a pack on. The eVent waterproofing works a treat. But best of all is the adaptability. Despite all its technical credentials, it’s also light enough to work as your outer layer in a two-layer system on the average breezy spring day, too. It’s wonderful to wear and I suspect I’ll be reaching for it all year long, whatever the season, whatever the weather. Near-faultless lightweight protection for all winds and weathers. Páramo waterproofs are unlike any other: soft as bedsheets, rustle-free and unlaminated, but impervious to water and highly breathable. The Andina is all of these things, with the added benefit of underarm zipped vents, Velcro adjustable cuffs and a cinchable hem – all of which help you regulate your temperature. It’s incredibly comfortable and soft enough to be worn over a short-sleeved base layer with no clammy feeling next to the skin. The pocketing is well thought out, too. There are two handwarmers, but when they become obscured by a backpack belt, you’ve got two inner chest pockets. The smaller one is still large enough for a phone; the larger one takes a map and more besides. And as for toughness: I wore this on a Scottish mountain and it has been on many similar walks since. Soft, well-fitted, hard-wearing – what more could you want? If you like to move fast when you're outdoors, love a scramble and/or have a tendency to sweat a lot, the Vapour Point could be the jacket for you. It’s a genuinely technical jacket for those who want to go further, higher, quicker. It’s made from Gore-Tex Active, which is constructed the same way as Gore-Tex (holes big enough for body heat to evaporate out but too small for water to enter in) but is lighter and more breathable so you can get a good stride on without overheating. Because of this, and to keep the weight down, Black Diamond have stripped back features like underarm vents. It’s a good length too, nullifying any chilly skin exposure on your lower back. Cuffs and hem are adjustable and the hood stays perfectly in place. In effect, it’s a paper-light layer that acts like full-on armour. Lithe, agile and very breathable. An excellent shell for fast movers. The word ‘mountain’ is used five times in Sprayway’s description of the Pandora. It has a ‘mountain’ hood, ‘mountain’ fit, sleeves, cuffs and four ‘mountain’ pockets. They clearly have a particular environment in mind, and it’s this high-altitude DNA, with all the attendant technology, that bumps up the price. The good news is, it’s tough enough to deal with that. The outer pockets are roomy and locked tight with big rugged zips, and there’s a chest and inner pocket too, the latter being soft and fuzzy to help protect the screen of your GPS or phone. The Gore-Tex fabric shucks off snow, rain and wind while remaining breathable on strenuous climbs. The hood isn’t as easily adjustable as I’d like when wearing bulky gloves, and a slightly wider storm flap would be welcome – it tended to get stuck in the zip and didn’t keep out the most tenacious breezes. Still, this jacket can be trusted to keep you warm and dry in very high places. A highly technical jacket designed for high-mountain walks. The Outflow is made from tough but lightweight ripstop fabric and includes the chest pocket (as well as waist ones) which tells you it is really meant to be used with a proper rucksack. Oddly though, the pocket is too large to hold a phone steady but too small for an OS map. There are pit-zips to help vent heat, and they are easy to grab and adjust on the move. Plus you get Velcro cuffs and a cinchable hem. It beat off wind and rain on a Shropshire walk, and did well when it warmed up; only blazing sunshine forced me to take it off. Before then, I’d romped along comfortably. It’s laminated so can feel clammy when next to the skin, but as part of a three-layer system, it’s great. A well-featured, hard-working waterproof at a great price. The Ruhi is a third of the price of the priciest jacket here, but is it a third of the value? Not at all. It might not come with all the bells and whistles to take you up a Munro, but if you need a reliable waterproof for everything up to high Lakeland fells, it’s a really decent option. It’s made from Aquadry, which has surprisingly high levels of breathability and a comfortable mesh-lining so you can wear it next to the skin. On a trip to the Peak District, I kept it on all day, despite working hard. When the rain mizzled in I stayed warm and snug. It cinches in at the hem and has velcro-adjustable cuffs which did a good job of keeping out the wind and wet. Annoyingly though, all pockets are located around the hem so you have no access when wearing a backpack. That aside, it performs very well. A practical jacket for everyday walks, but pocket placement lets it down. The Keela is a delight of a waterproof and, marvellously, is located at the happy end of the price spectrum. While some jackets are grizzly by nature – tough shells designed to put up a fight against a mountain and all its fury – the Prosport takes a more softly-softly approach. The outer fabric is one of Keela’s own design, a mix of fibres with a stretchy, vaguely fuzzy feel. The inner is an almost papery weave of polyester. It's soft and cosseting with a roomy yet snug fit to match. And it’s surprisingly breathable. I kept it on all day on a Welsh backpacking trip without needing to unzip the underarm vents. It beat off the wind and I emerged bone-dry after larking about under a waterfall. Both side pockets will swallow a map, and can be accessed with a pack on. There’s a generous chest pocket too. A backpack-friendly waterproof masquerading as an insulating jacket. I’ve been wearing the Lakpa Rita for over two years and if I’m heading for mountains and the forecast is dodgy, it is my go-to hard shell. It just has the whole package: a stiff, peaked hood, four taped pockets in all the right places and at the perfect dimensions, a slightly longer cut to cover most of the bottom, and a fit that isn’t too athletic but isn’t billowy either. At 452g it’s bang in the middle of the weight spectrum, so it offers powerful protection when sitting above a mid-layer, or just lightweight waterproofing over a base-layer in summer (without the interior getting clammy). Its ripstop and taffeta-layered eVent fabric has never let water in, and even without pit-zips, it doesn’t get too hot. Plus you get the kudos of a brand that was set up by Nepalese Sherpas. Yes it’s expensive, but I know I’ll be wearing it for a very long time. Superbly robust and reliable; ideal for mountain walks in the worst weather. Calling something a ‘budget buy’ can damn it with faint praise, but there is nothing faint about this jacket. 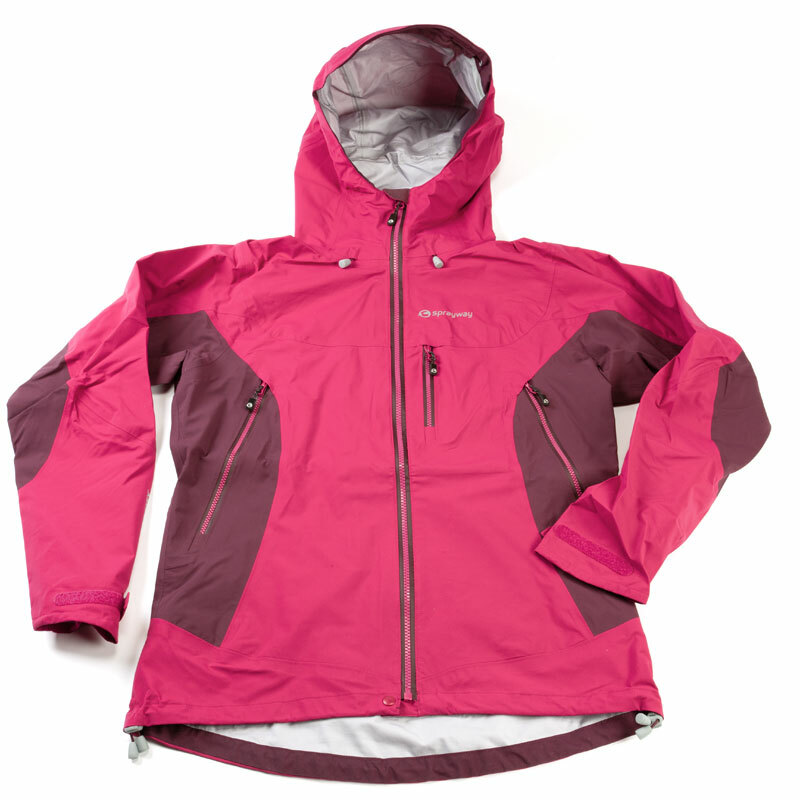 It represents exceptional value for money: trim, technical and just as waterproof as many jackets twice its price. The tidy cut gives a bit of coverage over the backside, but leaves you free to bring knee to chin if you’re so inclined. The soft fabric around the collar is of a quality you’d expect of something much more costly. Salomon’s AdvancedSkin fabric feels more like soft shell, so it’s very breathable, extremely comfy and doesn’t look too technical in polite society. On the downside, the hood isn’t very sturdy or adjustable, and there is neither a chest nor an inner pocket, so if the waist pockets are covered by your rucksack, you have nowhere to stash a phone, map or GPS handily. These aside: it’s an absolute bargain. A great-looking, comfy jacket at home on everyday and hill walks. Berghaus say they designed this new jacket with input from walkers who had completed the West Highland Way, so its focus is on moving light and fast over long distances. It lacks the Gore-Tex membrane used on Berghaus’ tougher shells but is still reliably waterproof. (That said, the brand’s much-loved Paclite jacket does most of what this does, is the same price and comes with Gore-Tex). The inside got damp when worn above a base-layer, so it needs a mid-layer to wick effectively, and after a few uses it developed a bit of a musty scent (thankfully it washed out). The main pockets are taped, while the chest pocket (which swallows a map) uses a simpler stormflap. There are also long venting zips up the torso. A decent package, but for me, the mix of fabric and features isn’t quite the right recipe for genuine year-round indispensability. A light jacket for long distances, but lacks the refinement of others. The Eidfjord is a do-anything, go-anywhere technical jacket that is equally at home in a summer downpour as it is in a wintry squall. While it’s light and compact enough to stuff into a rucksack quickly, the Eidfjord doesn’t compromise on durability: the three-layer waterproof fabric and water-resistant zips feel robust enough to endure the rough-and-tumble of all-weather walking. The hood is easily adjusted to keep out the elements, while underarm zips let out the heat when you want to. An adjustable hem and longer articulated arms allow for unhindered movement. The Eidfjord’s front pockets are placed high up the abdomen so they can be accessed even through a rucksack harness, and above these are two handy chest pockets. The main pockets could be more spacious, but it’s difficult to find any real fault here. It may breach the £200 mark, but the level of sophistication is on a par with some jackets of £250+. A versatile waterproof sharing many of the features of more expensive jackets. The Musto is a waterproof jacket that thinks it’s a soft shell. The soft face fabric is far nicer to wear than the average hard shell, and the hood is removable, meaning it can work as a warm and windproof outer layer even if it’s dry. It’s very warm, thanks to its two-layer Gore-Tex membrane and luxurious collar lining. But ask it to be a waterproof and it steps up perfectly (a surprise when you see that the simple main zip is only protected by a flap.) This makes it great for changeable days in spring, autumn and winter. It’s very trim and shallow, making it excellent for scrambling but with no cover for your bottom. It’s quite rustly (not great for wildlife-watching, even in a muted colour), the hood isn’t very sturdy and it lacks an outer chest pocket. But for comfort, warmth and adaptability on a hill-walk, this is a terrific investment. A robust waterproof whose soft shell DNA makes it highly adaptable. Tick in the box straight away: look at the pockets. Two map-sized pockets on the upper torso; the Neo Guide doesn’t even bother with handwarmers because it expects you to be wearing a proper rucksack. This is a specialist jacket where every detail has been thought about by a serious hill-walker. In terms of performance, it is very similar to the Sherpa jacket, although instead of eVent it boasts the flawless Polartec NeoShell. Also note the scooped back: it’s shallow at the front for high leg movement, but much deeper at the back to keep your hind quarters covered at the same time. It has huge double-zipped pit-zips, and the hood collar is the highest of any in this guide, fully covering my nose when zipped up. No law against wearing it everywhere, of course, but the Neo Guide is really built for mountain folk who say ‘bring it on’ to everything. 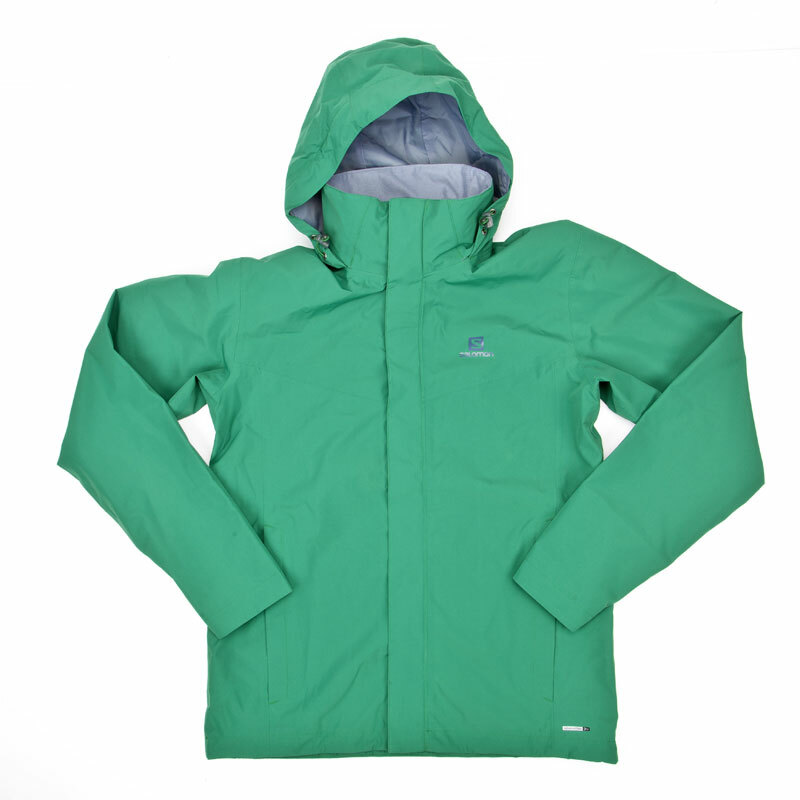 A serious mountain jacket; too specialised for everyday use.